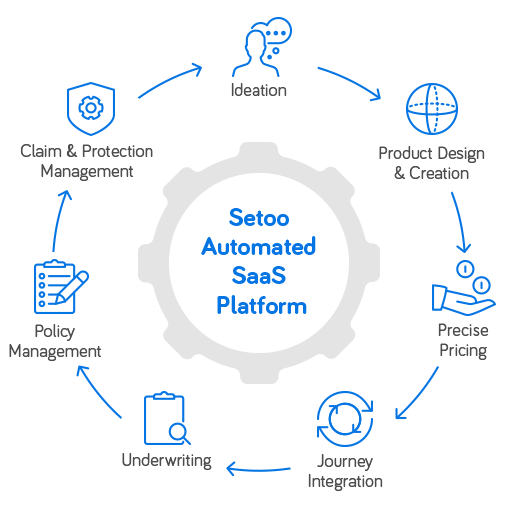 The Setoo SaaS platform automates the process of easily creating, integrating and distributing innovative on-demand protection products. The platform developed an advanced machine learning model tuned for actuarial practices and big data analytics technologies, to process millions of events online – such as flights schedules, weather forecasts, price changes, and delivery schedules. These advanced technologies allow us to precisely and automatically assess risks for thousands of possible use case scenarios. Based on explanatory mathematical models developed by our leading actuaries, our methodology allows us to assess, price and monitor the risk of customer experience disruption (frequency and severity) at the highest granularity level and derive the adequate business rules. These personalized insurance and protection products cover events with a digital signature with undisputable cause, such as a late delivery of goods from an e-commerce site and situations in which the consumer has no direct influence (no fraud possible!). Leading OTA Fly-in-Peace.com’s marketing team is looking to improve customers’ satisfaction levels and increase ancillary revenues. They will create a new personalized insurance on the Setoo platform to cover the risk of virtual inter-lining missed connections. Due to airport congestion in Athens, the flight will be delayed and Gabriel will miss her connection to Santorini. She is worried that she might not make it on time for the wedding ceremony. Luckily, Gabriel bought FIP’s Connection Guarantee coverage, built on the Setoo platform. Upon landing in Athens, Gabriel gets an SMS from the OTA announcing that a full refund of the connecting flight has been wired and offering alternative flights to Santorini. Gabriel is able to immediately book a new flight, taking off in the next hour. Now she can relax and enjoy a nice cup of coffee before boarding. Leading C2C e-commerce site BuyMyStuff.com’s new CMO is looking to make a strong first win in her new position, by adding a new source of revenue and improve customer retention. She decides to use Insurance as a business accelerator and to create a genuine insurance product for late arrival of “event-related” goods. Lionel wants to declare his love to Sophie on Valentine day, which is in exactly 45 days. He browses on different ecommerce sites for jewels and finds a ring to his taste on BMS.com. He hopes that the ring will arrive on time for Valentine day. Unfortunately, as we are approaching February 14, Lionel starts to understand that he might not receive his Valentine day present on time for the special evening he has organized to celebrate his beloved Sophie. On February 8, Lionel receives an SMS from BMS.com saying that the ring he ordered will not arrive on time for Valentine Day. Luckily, Lionel bought the Arrival Guarantee Protection built on the Setoo platform. Lionel can either stop the delivery, get a full claim-free refund of his purchase and 20% discount on his next purchase or receive the gift with a delay of a few days and get a 100$ coupon on his next purchase. Lionel chooses to cancel his purchase and used the 20% discount to buy a new gift. Now he can relax and go back to the nice letter he was writing to Sophie.